Googol Bordello "Start Wearing Purple"
I'm wearing purple today to show my support for gay teens combating homophobia. I don't see anyone wearing purple nor do I hear "purple" anywhere in the unintelligible lyrics! FAIL! Thanks! LICK. And congrats on the new apartment! And it looks great on you! grrlie bear, you got trees in your house while wearing 80's tight jeans with 80's cowboy boots posing that 80's gay prom pose? Umm, yeah. baby. 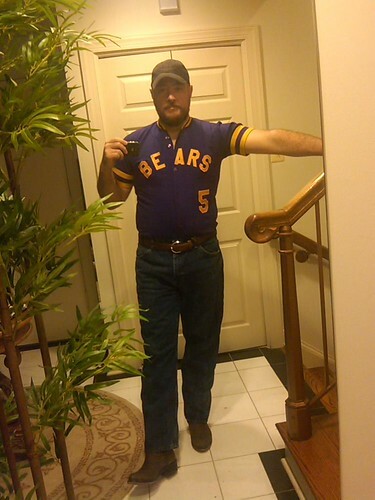 That 80's tight purple Bears baseball shirt rocks. I can always count on you to be glamorous in a grand classique gay sort of way.